Product Details - Material- vinyl materials Use -engaged for hours while gently massaging the gums and keeping away the buildup of tartar on the teeth and Gently massages the gums, Dimensions 12.5 cm, Suitable- All Breeds Dogs. 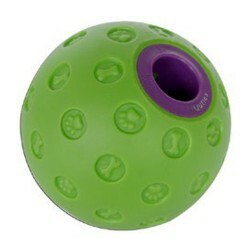 Product Information -These roll-a-round exercise balls come in a range of colours. They are the perfect way to keep your pet safe while enjoying the freedom to run around outside their cage. Energetic fun for your pet, Can be taken apart for easy cleaning.